The Ballistic Pendulum is the industry standard for the investigation of conservation of energy. Using our classic, time-tested physics apparatus, students can demonstrate the conservation of momentum, find the initial velocity of the ball, verify the determination of the initial velocity, find the time of flight of the ball, compute kinetic energy, and investigate projectile motion. 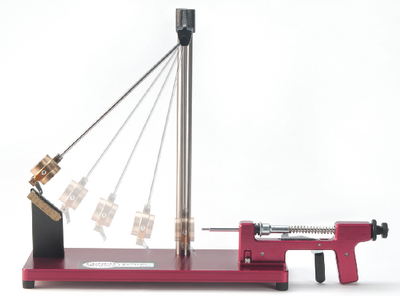 The pendulum swings freely on a hardened, low-friction bearing to ensure proper alignment. When the ball hits the bob and swings it up, a unique ratchet system holds the bob at its highest point of swing. The pawl at the base of the bob catches the ratchet, which has a scale for measuring height changes, providing a graphic demonstration of the conservation of momentum. Removing the pendulum arm allows for a variety of trajectory experiments. Caution: Caution:This toy is a small ball. It is not for children under three years.